I took this photo a few weeks ago, at a moment when I was surprisingly happy, considering that I was sitting in a car in a parking lot, waiting for my son's soccer practice to end, and knitting frantically away on one of several unbloggable projects which have taken up the last month, more or less. Why happy? Well, I was looking out my windshield at the mountains, lit by the setting sun, and getting my knitting work done (something which makes any sort of waiting more palatable), and listening to "Eli the Barrow Boy" by the Decemberists. You can see some fine specimens from my stitch marker collection in the photo (from left): a knotted loop of contrasting yarn; a small coil-less safety pin; the plastic ring that comes with the replacement head for an electric toothbrush; and the metal ring that sits between two halves of a certain type of click-able ballpoint pen. Unfortunately, by last week, the knitting (and perhaps even worse, the hours spent at the computer working on spreadsheets and writing out patterns) got to my upper back and neck, and left me unable to turn my head or look up or down without pain. Which is one reason I haven't been blogging much...anyway, I got some x-rays taken, and found out my neck is too straight (seriously), which apparently has not been good for my posture. I begin physical therapy this week, and I strongly suggest that y'all be aware of your body position when you knit, and take frequest stretching breaks, my friends! In one of the comments on my last post, Janet asked if I could direct her to some posts about the Selva Skirt. There is a category for it (look on the lower right hand part of the page), but there aren't many posts to be found, simply because the Selva Skirt pattern was created for publication in a magazine, and hence was unbloggable before publication. Well, it's after publication now, and since at least one person is interested in how Selva came about, I thought I would provide a few details. I often look through stitch dictionaries for inspiration, and in this case, the skirt was absolutely inspired by the stitch pattern, Hearts of Oak from Barbara Walker's Fourth Treasury of Knitting Patterns. I thought the texture of this stitch pattern was fascinating, and after swatching, I thought its density would be perfect for a fitted knit skirt that would hide a few posterior, shall we say, imperfections. (Plus I hate wearing G-strings-- not required for Selva, ladies!) Also, as I recall (the themes that Interweave provided to designers for the Winter 2007 issue are no longer online), one of the suggested themes for that issue was tailored, fitted garments, which seemed perfect for Selva. Above is the wrong side of the swatch I sent off to Interweave Knits with my pattern submission, back in February '07; the photo is crap because it was an afterthought, taken with my cellphone camera in my car just before I put the submission materials in the mail. While swatching, I also found that the Hearts of Oak chart has a number of errors. The most important part of the chart, the pattern repeat, is correct, but the outer edges of the chart are not. Always be aware that errors may be (and probably are) present in published charts and patterns! In the case of this stitch pattern, I debated which side to use for the right side; both sides are really cool. One reason I decided to go with the "right" side was the waistband. As I was swatching, I had started to think about how I would do the waistband decreases, and had concluded two things: first, that working the decreases into the stitch pattern would require a better mind than mine, and second, switching to a less dense stitch pattern, like stockinette or ribbing or, well, just about anything, would mean losing that nice tight fabric just when it would be great to have a bit of a girdle effect, across the tummy and hips. So after examining both sides of the swatch, I decided that the V-shaped knit sections on the right side were just begging to be extended into long ribbons to form the waistband, and with some experimenting, I came up with what you see at the top of the above swatch: the ribbons include decreases and increases, and thus retain at least some of the density of the Hearts of Oak pattern. 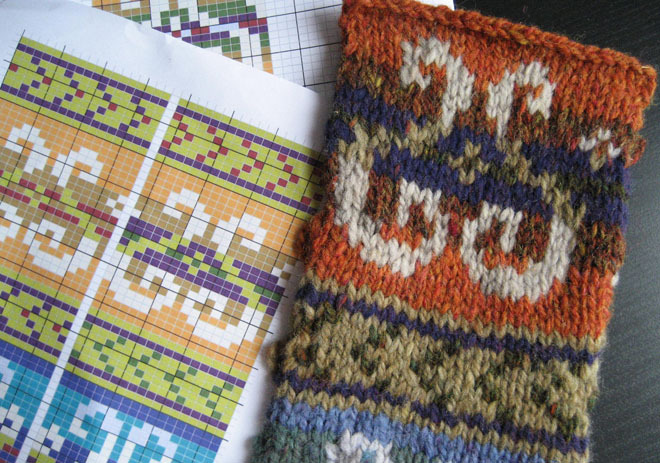 Next: The evolution of Selva's design after she was accepted by Interweave Knits for their Winter 2008 issue. As for the colors, I like the combinations in both of the large motifs-- the orange and the blue/green bands-- and I like them both with the narrow motifs. But I don't think I like the large motifs together: the bright orange and the muted green just don't do it for me. And I've already used up a precious ball of that green to make swatches for a submission to Vogue Knitting*, so that is the band that will require major color re-mixing. 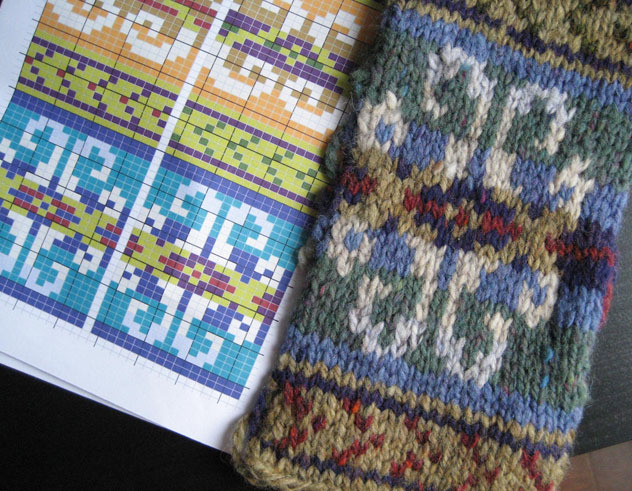 Once I re-mix the colors, redraw the motifs so they don't come out so vertically stretched (especially the lower one), and fiddle with the background bands so they blend more subtly, I'll be ready to try another swatch. *WHICH they accepted for their Fall 2008 issue; woohoo! I've had several yarn deliveries in the past week. The RYC Cashsoft has arrived and when I have a moment, I'll try to figure out how to work one or both colors into my Wyvern Wrap. The other yarn? Doesn't look like much, I know, but it's lovely, and destined to become something for the IK Summer 2008 issue (and that's all I have to say about that). Look at what the putto* dragged in. I figure I won't be living in a house adorned with putti* forever, so I'd better make use of them while I can. I especially like the spiderwebs, which I've concluded must be good luck here in Italy, as no one seems willing to remove them. 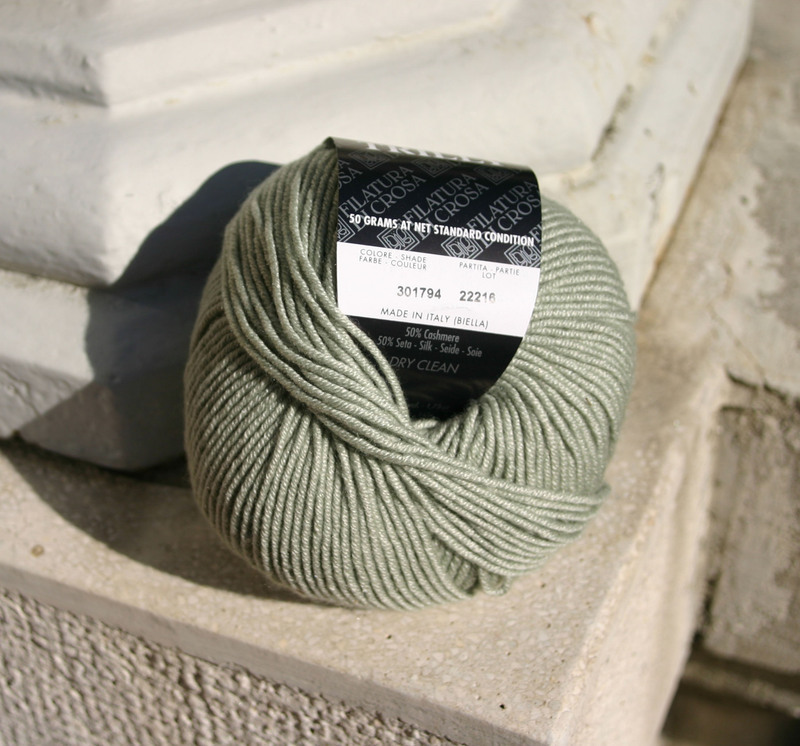 Anyway, the Debbie Bliss Cashmerino Aran for my own Sherwood has arrived! I was concerned that it would be too teal, but in fact it is the color of lake shadows, a lovely deep blue calmed with gray, and leaning only slightly toward green. 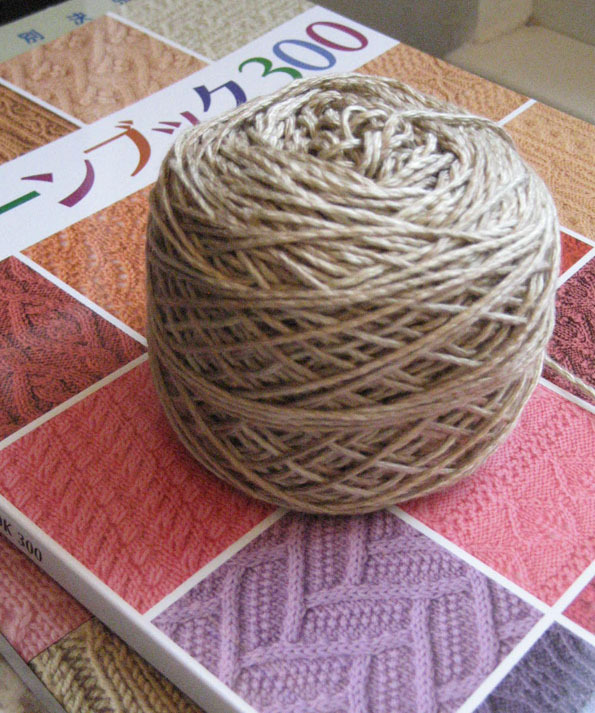 It's also deliciously soft; I have a feeling this won't be the last time I use this yarn for something. Full disclosure: this announcement is somewhat disingenuous, as it gives the impression that I will be getting to work straightaway on Sherwood for me. I cannot use the word "unfortunately," because I am delighted to say that I have had several pattern submissions accepted for various publications (trying to walk a fine line between being coy and braggartly here), but the simple truth is that, since they are all due by the end of December, I probably won't have much time for Sherwood until January. I truly am pleased with how the Chinese Lace Pullover turned out--and now, it's time to move on. Not that I haven't done so--the projects have been lining up--but at the moment I have five (5!) non-bloggable ones hanging around: an unacceptable situation. If the non-bloggables all get rejected by the various editors considering them, I will suddenly have a wealth of material to blog about, but in the meantime: Trilly, a lustrous pale celadon in silk and cashmere (a close-out from WEBS!). Yes, I can only stand to wear any wool, cashmere included, for about four hours--about the time it takes to get dressed in my Saturday finest, go out to drinks and dinner, and return home, where I can sigh in relief as I remove the offending garment. And yes, silk/cashmere is not the sort of stuff you make into a workhorse cardigan that you can throw over a turtleneck (thus avoiding any itching problems) and wear to your son's late-season soccer games. 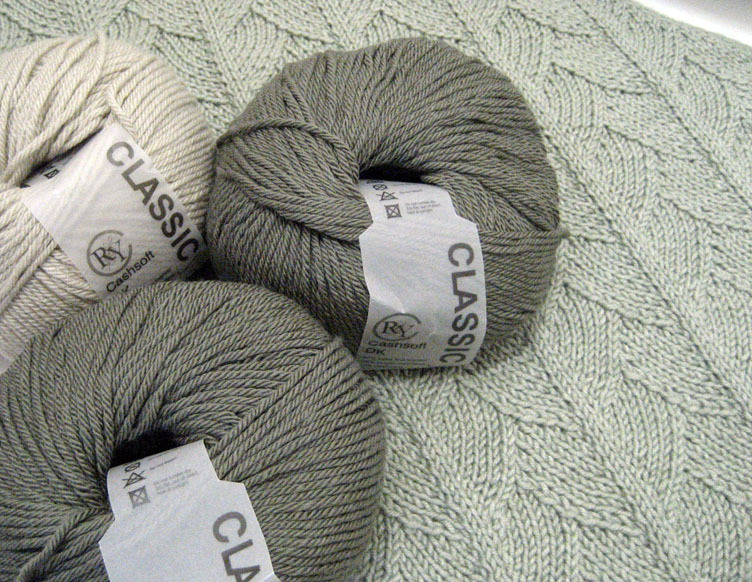 Still, this is a gorgeous yarn and I MUST make something of it. 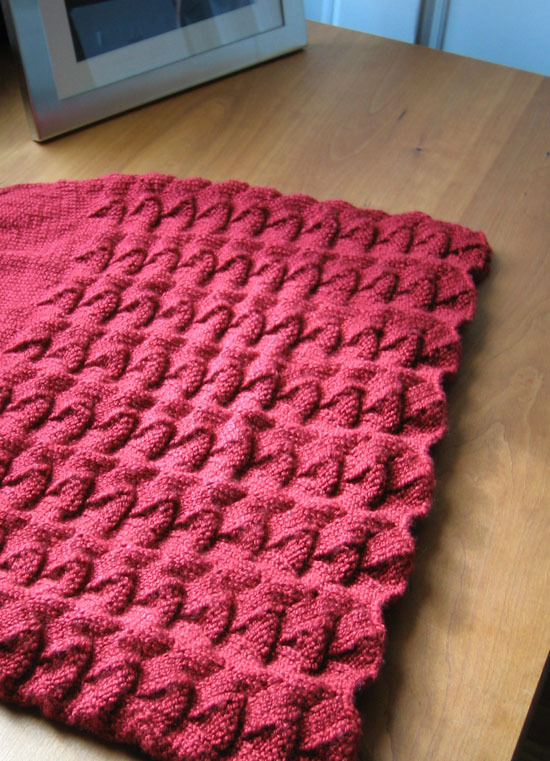 Although I've been knitting furiously for the past week, little or none of it has been bloggable (bad news). However, by next week, I should have 2 or 3 completed pattern submissions to send off to knitty in time for the deadline for their July issue (good news). My limited experience with submissions for publication, whether print or online, has been that rejections are to be expected (bad news). 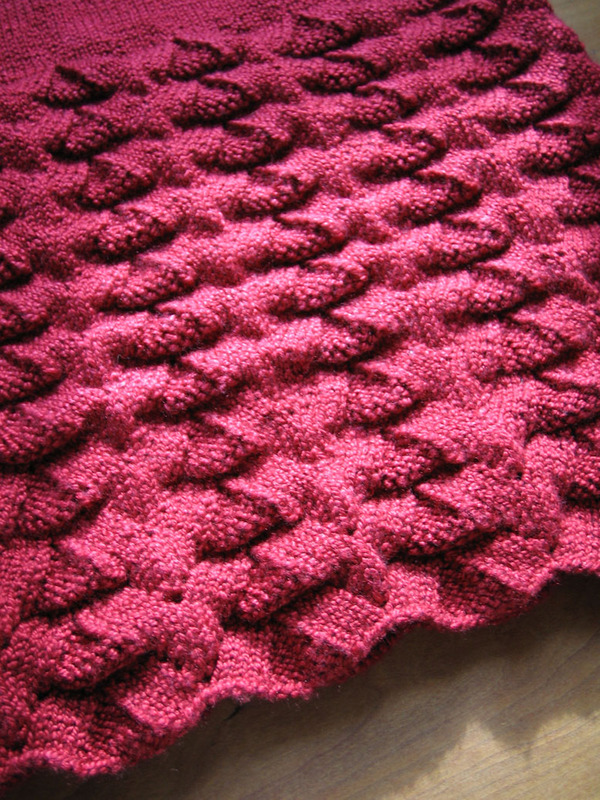 I've heard that knitty's editor, Amy Singer, at least lets you know quickly whether your pattern will be used (good news), and if NOT (bad news), then I will be posting those patterns here on my blog, instead (good news). I haven't given up on Chinese Lace, and the other day I was flipping through the yellowing pages of 1500 Patterns, a softcover "Knitting Encyclopedia" from Mon Tricot that I've had for about 20 years, when I found this. Look familiar? 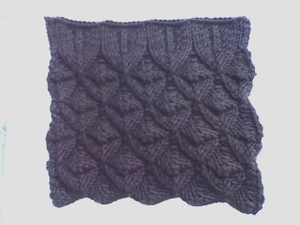 Aside from using k2togs instead of SSKs, it is a block of four pattern lines from Chinese Lace, and that lovely diagonal has me thinking I might resurrect this idea--or at least the mock wrap part of it, combined with C.L. sleeves.